Early in the day, preheat the oven to 350° f and generously butter the bottom and sides of one 9-inch springform pan and one 9-inch round layer cake pan. Wrap the outside of the springform (but not the cake pan) with aluminum foil, covering the bottom and extending all the way up the sides. Very important: Line the bottom of the cake pan (but not the springform) with parchment or waxed paper (don't let the paper come up the sides). Put one package of the cream cheese, 1/3 cup of sugar, and the cornstarch in a large bowl and beat with an electric mixer on low until creamy, about 3 minutes, scraping down the bowl a couple of times. Blend in the remaining cream cheese, one package at a time, scraping down the bowl after each. Increase the mixer speed to medium and beat in the remaining 1 cup sugar, then the vanilla. Blend in the eggs, one at a time, beating well after adding each. Beat in the cream just until it's completely blended. Be careful not to overmix! Gently spoon the batter into the foil-wrapped springform and place it in a large shallow pan containing hot water that comes about 1 inch up the sides of the springform. Bake the cake at 350° F until the edges are light golden brown and the top is slightly golden tan, about 1 and 1/4 hours. Remove the cake from the water bath, transfer to a wire rack, and cool in the pan for 2 hours, cover with plastic wrap, and refrigerate (while still in the pan) until it's completely cold, about 4 hours. While the cheesecake is baking, make the pastry cream. Heat the milk, cream, and butter together in a large saucepan over medium-high heat just until it bubbles around the edge, stirring until the butter has melted and is incorporated. Remove from the heat. Meanwhile, beat the egg yolks, sugar, and cornstarch together in a large bowl with a mixer on high until the mixture thickens and turns light yellow, about 3 minutes. Reduce the speed to low and beat in about 1 cup of the hot cream mixture. Return this to the saucepan, stirring constantly over medium heat until the mixture thickens and comes to a full boil (watch carefully as this will take only about a couple of minutes). Remove from the heat and stir in the vanilla and food coloring. Immediately transfer to a medium-size bowl (this stops the cooking), place a piece of plastic wrap directly on the surface of the pastry cream (this prevents a skin from forming), and refrigerate until cold and set, at least 2 hours. While the pastry cream chills, make the sponge cake. Check that the oven is preheated to 350° f and that the water bath has been removed. In a small bowl, sift the flour, baking powder, and salt together. Beat the egg yolks in a large bowl with an electric mixer on high for 3 minutes. While the mixer is still running, slowly add 1/4 cup of the sugar and continue beating until thick, light yellow ribbons form in the bowl, about 5 minutes more. Beat in the extracts. Sift the flour mixture over the batter and stir it in by hand, just until no white flecks are visible. Blend in the melted butter. Put the egg whites and cream of tartar in a clean medium-size bowl and , with clean, dry beaters, beat with the mixer on high until frothy. Gradually add the remaining 1/4 cup sugar and continue beating until stiff peaks form (the whites will stand up and look glossy, not dry). Fold about one-third of the whites into the batter, then the remaining whites. Don't worry if you still see a few white specks -- they'll disappear during baking. Gently spread out the batter over the bottom of the single cake pan and bake until golden (not wet or sticky) and the center springs back when lightly touched, about, 15 minutes. Let the cake cool in the pan on a wire rack for 15 minutes, then turn out onto the rack and gently peel off the paper liner. Let the cake cool completely. Cover with plastic wrap and refrigerate until ready to use. When the cheesecake and sponge cake are cold and the pastry cream has set, assemble the cake. Keep the cheesecake in the springform and gently spread the pastry cream over it, using a rubber spatula (avoid stirring the cream at this stage, as you might break its gel). Place the sponge cake, top side up, on the pastry cream. Press down gently. Cover the cake (still in the pan) with plastic wrap and freeze overnight. 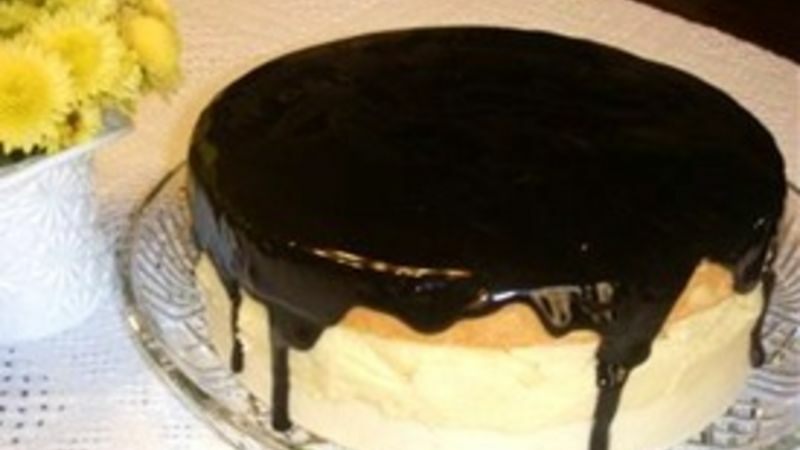 To decorate the top of the cake with the fudge mirror, combine the ice cream topping and corn syrup in a small saucepan over low heat, stirring just until it's spreadable (don't overheat or let boil!). Take the cake out of the freezer and, using a long, marrow metal spatula, quickly spread the fudge over the top while it's still in the pan. Using the tip of a pointed knife, push a few drips over the edge of the cake. This gives the cake a finished look. Return the pan to the freezer until the mirror has set (do not cover), about 30 minutes. Fill a pastry bag fitted with a small round tip (#2) with the whipped cream. Pipe a white web on top of the cake, making thin lines 3/8 inch apart (don't worry if the lines are a little wavy, as that's a nice homemade touch). Return the cake to the freezer until the web has set, about 30 minutes more. To serve, let the cake stand at room temperature for 10 minutes, then release and remove the ring of the springform, leaving the cake on the bottom of the pan. Place on a serving plate and refrigerate until ready to serve (this cake takes about 2 hours in the refrigerator to thaw enough to easily slice). Use a sharp straight-edge knife, to cut it. Refrigerate any leftover cake or wrap and freeze for up to 1 month.